The NES was a great machine. That doesn't mean we need its worst games on 3DS. Nintendo does many things well, chief among them recycling old video games. There's obviously a market for this type of content, and with that being said, the company releases Super Mario Bros. and other classics on every device imaginable. Just look at 3DS. We have 20-year-old Game Boy titles available on the eShop, as well as a handful of NES games with snazzy 3D effects. Speaking of NES, although it's one of the greatest video game consoles of all time, Nintendo needs to leave it be, or at least make better selections. We'd also like to see more recent titles from other systems. The world can do without Xevious. That much is true. Point being, those old and dusty 8-bit games were a lot more enjoyable when we were kids, back when the line between quality and crap was a bit blurred. That's why we spent hours watching Leonardo and the gang get electrocuted in the first Teenage Mutant Ninja Turtles game, under Konami's now defunct Ultra label. TMNT was OK because we were ten and didn't care, but good luck getting us to play it today. No chance. With this in mind, we have little to no interest bothering with the original Kid Icarus, which is the latest NES game to receive the 3D Classics treatment (Nintendo will release the cult hit in Japan first). There's no need to ruin those childhood memories by showing us how average Pit's first adventure truly is. Just leave it be. To that end, Nintendo should dip into its back catalogue of Super Nintendo games, or for that matter, Nintendo 64 hits. The Legend of Zelda: Ocarina of Time 3D was a huge success. Give us Super Mario 64, Paper Mario, Mario Tennis and Donkey Kong 64. Put 3DS to work, instead of regurgitating the likes of Urban Champion and Xevious. Seriously, Nintendo. Xevious? Why? As for those NES titles, don't expect us to pay $5.99 for those bad boys. They're worth $2.99 at the most, 3D or no. Bottom line, the company has a wonderful library of games and needs to stop messing around. 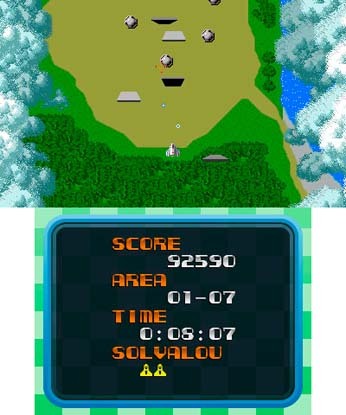 Less Xevious and more Mario, please.